“The memories of the tsunami are fresh in my mind,” said Rena. Then 14, she remembers fleeing with her young brother as the black mountain of water came crashing down on her fishing village in the Indonesian province of Aceh. “We ran towards higher ground. Just behind us two people were running but got caught in the wave. We never saw them again,” she said. The 26 December 2004, a tsunami devastated Aceh. More than 160,000 people died here, making up half of the overall fatalities that occurred across the Indian Ocean. As a colleague said – you were either drowned, dead or devastated. In Rena’s village of Kreung Raya, 1000 people died. She lost two sisters and a brother. Now 24, she says the trauma is still with her. “Every time there is a small earthquake or heavy rain, the tension comes back,” she said. In the first few days, relatives came to her village with food and clothes. And then a second massive wave came – of helicopters, ships and trucks as international aid poured in. I was part of that wave, working for the Caritas aid network. I came to Kreung Raya in that initial phase. Caritas had tried to kick start their local economy as quickly as possible by replacing lost boat engines, nets and drying racks. In early 2005, there was almost nothing left standing apart from a half-destroyed Mosque. Rena and her father, Abas, were some of the people I spoke to about what they had gone through and what help they needed. Abas invited me to go night fishing with him on his boat, the Centosa, and I jumped at the chance. Centosa means ‘peaceful’ and it was a peaceful night. Other fishermen sailed over to our boat. They told quiet stories of returning from long fishing trips to find their families dead and their homes washed away. Almost 10 years later I returned to Aceh to see if I could find the crew of the Centosa and through them understand what the lasting impact of the tsunami has been. Today the capital Banda Aceh is transformed. Where there was vast empty spaces, now there are houses, hospitals, markets and schools. 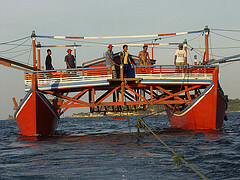 Apart from the odd memorial and Tsunami Museum, you could be in any thriving Indonesian town. On the drive up to Kreung Raya, cane deck chairs in cafes face the sea. What was once a place of total destruction is now a spot for weekend relaxation. When I arrive, there is a pink bouncy castle next to the rebuilt village. 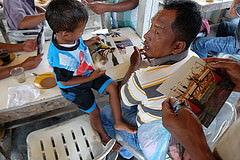 Armed with their photos, I drop into a fisherman’s cafe. They’re fascinated and soon I’m in front of Abas and his daughter’s house. He is thankful for the international relief effort but doesn’t believe it was the most important thing. “My job is still the same. Every day I go to the sea and fish. My son dries the fish. My wife sells it. We got our lives back not through aid but because we worked hard,” he said. I ask about the rest of the crew of the Centosa. One whose wife was killed in the tsunami has married her sister. He still works on the boat. Others have drifted away to work as market traders or government employees. The youngest crew member died of Malaria in 2009. Not every aid project in Aceh was a success. There are aid-built houses now abandoned as their occupants moved away in search of other opportunities. Some things failed, but many more succeeded. 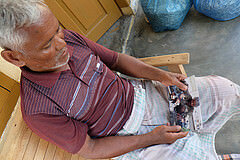 “I still have the same engine I got after the tsunami,” said Abas. On 26 December 2014, the villagers of Kreung Raya will be going to a new Mosque. They will be remembering those who lost their lives. For them the events ten years ago are not history but living memories. See a photo gallery of then and now images of Abas, Rena and others.